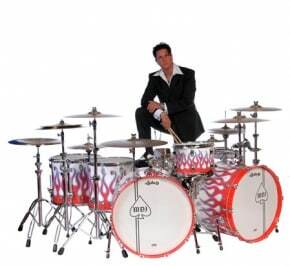 In recent years it has become quite fashionable to market drum gear under the guise of a well known drumming star’s “signature” Whether it’s a drum, cymbal or a full on double-bass mega-kit, It’s like buying a baseball-bat with “Babe Ruth” or “Willie Mays’’ burned into the hilt. In some ways it can be very reassuring to know that we mere mortals can stand at bat, or perhaps more appropriately sit on the throne, just as our heroes do. It gives us a sense that if it’s good enough for them, it’s sure as hell good enough for us! 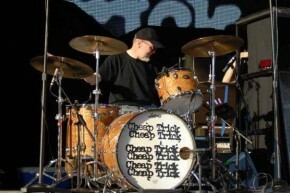 On Oct 18th the Bun E. Carlos signature drum-kit made its debut at the Hollywood Vintage and Custom Drum Show. The kit, like its namesake, is a rock and roll icon and with a 14’’x24’’ bass-drum, a 9’’x13’’ rack-tom and a 16’’x16’’ floor-tom these drums will feel as familiar as that pair of jeans you need to wash! 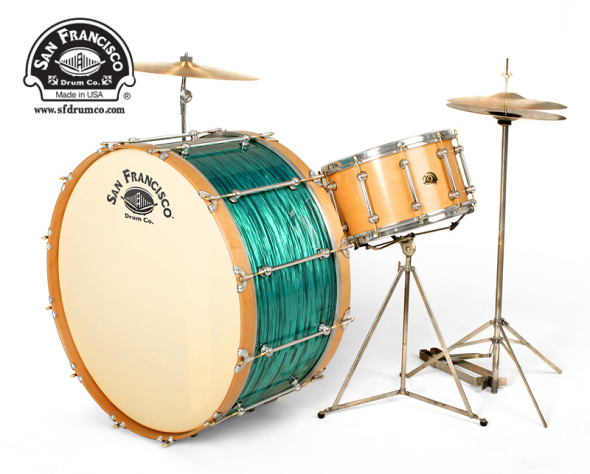 Each drum features Bun E’s personal badge along with the Ludwig 100th anniversary badge and just like the snare drum, all come wrapped up in Bun E’s exclusive Glass-Glitter Citrus-Mod finish which looks as if it oozed straight out of a psychedelic Slurpee machine. 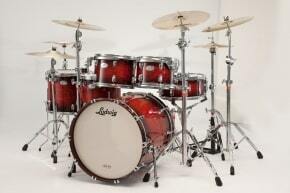 These beauties are built using Ludwig’s Maple / Poplar Legacy shells. The Legacy shells are a tip of the hat to the three-ply shells made in Ludwig’s Chicago factory in1928 up through the 60’s and early 70’s. Now crafted with care in Monroe, North Carolina, these gorgeous tubs are a combination of the most advanced processes in drum making and 100 years of American drum making “know-how”. Who else can say that? If you’ve been looking to buy a classic set of drums, but want the responsiveness and state of the art quality of a modern drum set, you may have to…Surrender… to the Bun E. Carlos signature kit from Ludwig. To learn more about Bun E’s drums and all of Ludwig’s great products visit: www.ludwig-drums.